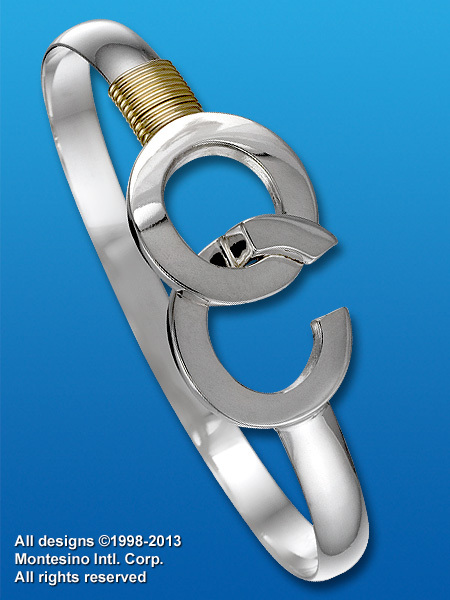 The Ocean City Destination® Hook Bracelet is the ultimate jewelry statement of the sun and fun of Ocean City, Maryland. With its stylized letters joining at the top of the piece symbolizing the “hook” that OC has on your heart, the bracelet also features ten wraps of 14 Karat Gold which represent the ten-mile length of the peninsula. The Ocean City Destination® Hook Bracelet comes in four different widths all in 14 Karat Gold or solid sterling silver. From the Boards to the Beach, flash your local pride with the “OC Hook”!